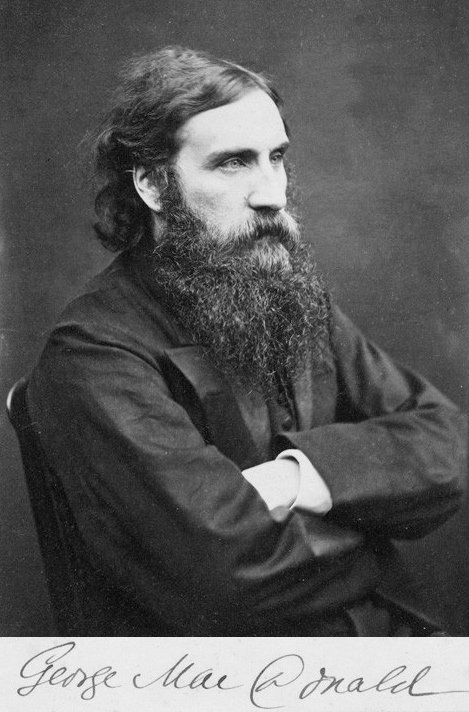 George MacDonald (10 December 1824 – 18 September 1905) was a Scottish author, poet and Christian minister. He was a pioneering figure in the field of fantasy literature and the mentor of fellow writer Lewis Carroll. In addition to his fairy tales, MacDonald wrote several works on Christian apologetics. His writings have been cited as a major literary influence by many notable authors including W. H. Auden, J. M. Barrie, Lord Dunsany, Hope Mirrlees, Robert E. Howard, L. Frank Baum, T.H. White, Lloyd Alexander, C. S. Lewis, J. R. R. Tolkien, Walter de la Mare, E. Nesbit, Peter S. Beagle, Neil Gaiman and Madeleine L'Engle. C. S. Lewis wrote that he regarded MacDonald as his "master": "Picking up a copy of ''Phantastes'' one day at a train-station bookstall, I began to read. A few hours later", said Lewis, "I knew that I had crossed a great frontier." G. K. Chesterton cited ''The Princess and the Goblin'' as a book that had "made a difference to my whole existence". Elizabeth Yates wrote of ''Sir Gibbie'', "It moved me the way books did when, as a child, the great gates of literature began to open and first encounters with noble thoughts and utterances were unspeakably thrilling." Even Mark Twain, who initially disliked MacDonald, became friends with him, and there is some evidence that Twain was influenced by him. The Christian author Oswald Chambers wrote in his "Christian Disciplines" that "it is a striking indication of the trend and shallowness of the modern reading public that George MacDonald's books have been so neglected".